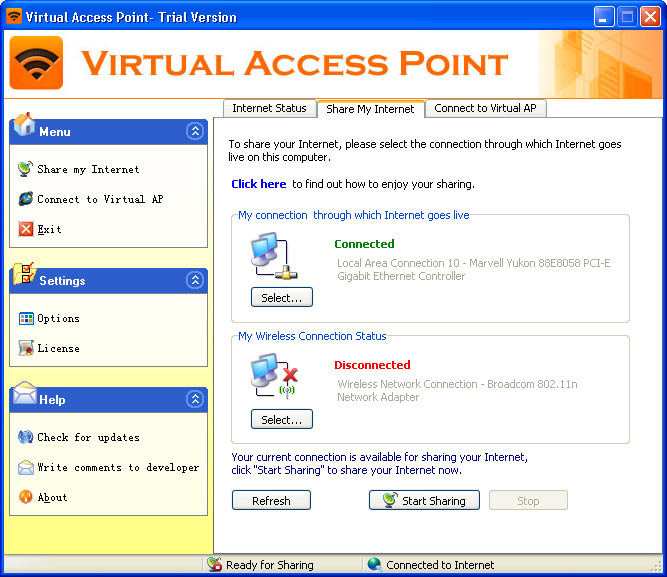 Virtual Access Point (Virtual AP) - is an easy-to-use software that turns any LAN-connected PC or laptop into a Wi-Fi wireless access point. So anyone nearby can surf the Internet through your sharing. Also, your iPhone, PDA, mobile or what ever, can enjoy the Internet by connecting to the wireless network broadcasted by Virtual AP. This is also an ideal solution for setting up a temporary AP in a hotel room, meeting room, at home or the like. Virtual AP - Turn your laptop into a wireless access point (Wi-Fi router). Wireless Adapter, WinXP SP2 or above. * Share Internet with another laptop - It turns one of your laptops into a Wireless Access Point(WAP, or Wi-Fi router or Wi-Fi gateway), other laptops can connect to the Wi-Fi network to surf Internet. * Share Internet with iPhone, iPod, PDA, xBox or whatever - Your iPhone, PDA or other Wi-Fi devices can enjoy the wireless network created by Virtual AP. * Wi-Fi Security - The wireless network created by Virtual AP is security-enabled. Anyone who wants to connect MUST have the network key (Password). * ONE-CLICK Sharing - One button to start, one button to stop, that's all. * Simple - It is very simple, one-click sharing. You even don't need to read the manual. * Virtual Access Point is Soft - It turns your laptop into a Wireless Access Point(WAP), without any third hardwares. * Share 3G over WiFi (3G Sharing) - Share your 3G connection with your family. Virtual Poet can help make you the poet you have always wanted to be! Quick access to main Windows functions, folders and documents. Helps to use the PC as VideoRecorder. AccessBar is the ultimate desktop organization tool. Virtual Impact is a combination of space combat and soccer. Virtual stripper right on your PC desktop. Incredible picture quality! Qweas is providing links to Virtual Access Point 3.7 as a courtesy, and makes no representations regarding Virtual Access Point or any other applications or any information related thereto. Any questions, complaints or claims regarding this application Virtual Access Point 3.7 must be directed to the appropriate software vendor. You may click the publisher link of Virtual Access Point on the top of this page to get more details about the vendor.